A key to a successful residential audio visual installation is to understand exactly what you, a homeowner, need to have in any sound system being installed in your house. Too many people make the mistake of thinking that just because they’re having the installation done in their home, it does not have to be a professional system to get the kind of sound and video quality you really want. This is a mistake because most of what you can buy at a local store will not deliver the clarity you are looking for.If you’re going to have a residential audio visual installation completed, you should have it done by people who completely understand the different needs that occur in a residential setting. For example, there are many different areas of the house where different people live. This automatically creates a situation where you should be able to have a central control of your audio visual components, allowing them to be broadcast throughout the house or limited to certain areas. You don’t want to have Junior’s music blasting in your bedroom because he is trying to study for an exam while you are trying to sleep before an important presentation at work the next day. This is where having experts in residential audio visual installations comes into play.One of the ways a professional residential audio visual installation plan deals with various competing interests is to create zones in the house. This is called multi-zone entertainment, and it’s a new way to enjoy your favorite music, your favorite sports, or your favorite news anywhere in your house. Simultaneously, what multi-zone entertainment does is create zones, where your children or your parents or whoever else lives in the house, have the ability to have their own zone, where they can listen to or watch the things they love without necessarily interfering with the overall ambiance of the house. More importantly, they will not be influencing what you have to listen to or watch. The added benefit of having a multi-zone distributed home entertainment set up is that it removes the clutter from one specific area. Our professional installation ensures that all components are hidden and out of sight except the ones you use to control the system. In addition, when you move around the house, you have the ability to take your entertainment with you and not have to be in a specific room to enjoy the entertainment you desire.On top of all this, the most important aspect is that when you move from your family room to your living room or even to your outdoor entertainment space, you want the ambiance to be a certain way. 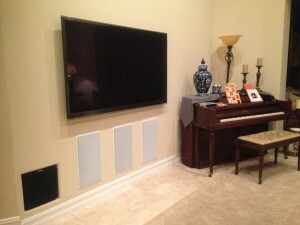 This means having complete control and for the sound quality to be the same from one room to the other. As professional installers who do residential audio visual installations on a daily basis, we make sure that the ambiance, the speaker quality, and the visual quality are exactly the same in every room. This way, your experience is complete no matter what room of the house you happen to be in.